THE AMERICAN COLLEGE OF GREECE > ACG ART > INFORMATION > NEWSLETTER > ATHENA POLITOPOULOU-KARGSTEN DESIGN THE "ACG ALUMNAE AWARD - MARIA WEST"
1. 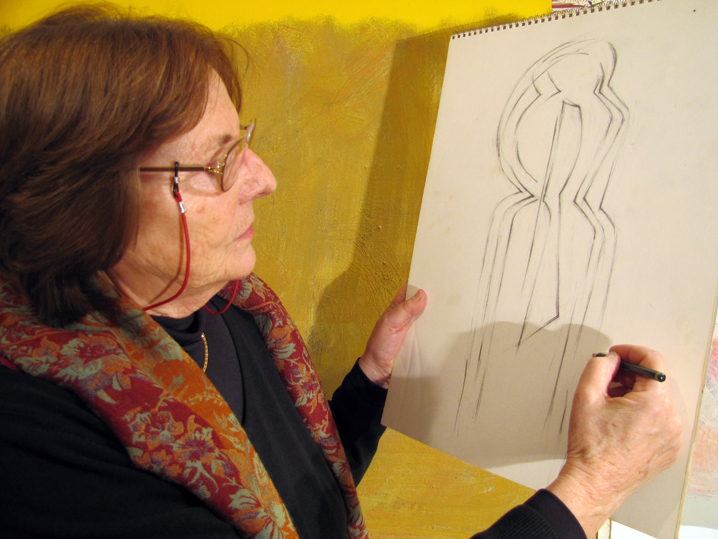 Athena Politopoulou-Kargsten designs the "ACG Alumnae Award - Maria West" on paper. 2. 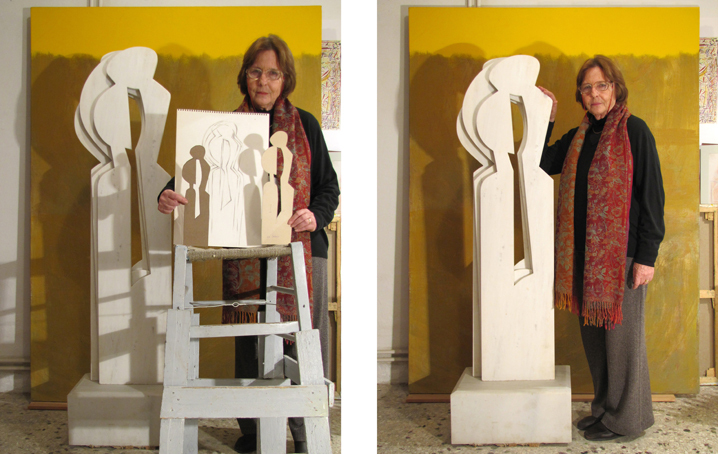 Athena Politopoulou-Kargsten presents the two maquettes for the "ACG Alumnae Award - Maria West". 3. 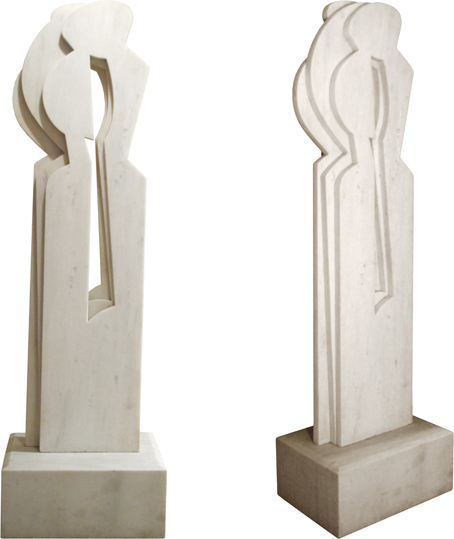 Athena Politopoulou-Kargsten's marble version of Anatasis of 1987. 4. Athena Politopoulou-Kargsten's plexiglass version of Anatasis of 1993. 5. Detail of Athena Politopoulou-Kargsten's plexiglass version of Anatasis of 1993. In 2011 The American College of Greece instigated the "ACG Alumnae Award - Maria West", through which it honors prominent alumnae who have demonstrated vision and leadership in their respective field of activity and have left a lasting legacy in our society. The award commemorates Miss Maria West (1827-1894), who established an educational institution in 1875 in Smyrna, to which ACG traces its origins. The award has been created by renowned sculptor and Pierce '57 alumna Athena Politopoulou-Kargsten. 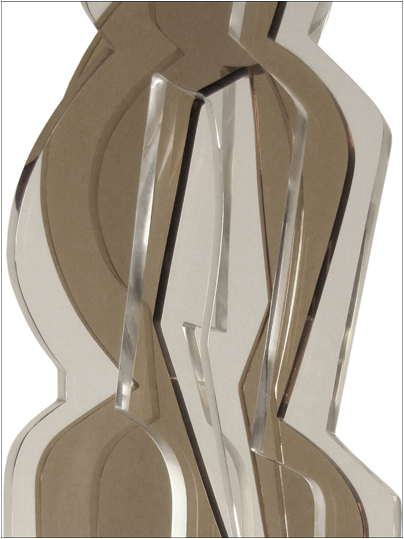 In response, Politopoulou-Kargsten based the award's design on her work entitled "Anatasis" (Exaltation) of 1987. 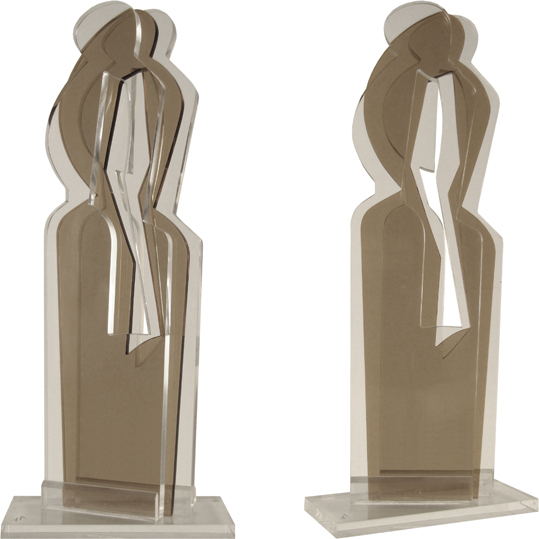 This sculpture is part of the Triforms sculpture series, in whence three surfaces represent the human form in slight motion. The sculptor places three thin surfaces, silhouetted after slightly varied outlines of the human form, are superimposed in perspective one against the other, evoking the movement of dance. Herewith, it is worth underlining Politopoulou-Kargsten's original contribution to sculpture. In particular, the Triforms evoke the sensuality of the feminine figure in motion as much with dynamism as lyricism. Triforms are set in various poses of graceful dance movements, whose sweeping curves and smooth surfaces can be viewed and fully appreciated from all sides. The open spaces within the shapes of the abstracted figure become part of the design, and accentuate the perspective, through which an intricate play of light and shadow seeps in. Politopoulou-Kargsten's Anatasis was inspired from variations of Archaic 'korai' of Greek antiquity. Herewith, she represents a standing female figure in calm movement. Especially the middle surface, which chromatically varies in the perspex version, refers to the movement of her veil. The sculpture's quality in the round is based on the interplay of lines. Every line is perfectly thought through and additively contributes along with the others towards a harmonious composition. The opening in the form lets the light penetrate the body highlighting its wise design. This opening acts as a relieving shape to the material's weight. The balance of curves and straight lines reflect the harmonization of freedom and discipline. Several pencil drawings of the female figure in motion enable the viewer to understand how Politopoulou-Kargsten's Anatasis was conceived. These drawings were transcribed into paper maquettes, which Politopoulou-Kargsten transferred onto monumental sculpture. The impeccable sense of Anatasis was effectively defined by various materials; marble, wood, and perspex. The present first version of Anatasis in Dionyssos marble evokes purity and elegance. The second version in perspex has the added attraction of transparency, which allows one to see right through the forms. The third version in wood evokes primordial sources of sculpture. The interplay of materials, extraordinarily moving in their poetic contrasts of texture, arouses an emotional response in the viewer. In closing, it is worth noting that further to Politopoulou-Kargsten's given contribution to abstract sculpture -which concerns nonrepresentation- Anatasis is characterized as an abstracted work of art. ACG Alumnae Award - Women in Arts & Literature Award: Ms. Maya Lymberopoulou, Pierce '57, Theater Actor & Director. ACG Alumnae Award - Women in Business Award: Ms. Theano Lianidou, Deree '88, General Manager, Mars Italy. ACG Alumnae Award - Women in Education Award: Dr. Nancy Papalexandris, Deree '66, Professor, Athens University of Economics & Business. ACG Alumnae Award - Women in Philanthropy Award: Ms. Vana Lavida, Deree '79, President of MDA Hellas. ACG Alumnae Award - Women in Public Service Award: Professor Anna Benaki, Pierce '52, Former President of the Hellenic Parliament - Member of the Academy of Athens. Maria West Life-Time Achievement Award: Ms. Eleni Cubitt, Pierce '42, Founder of the British Committee for the Reunification of the Parthenon Marbles. Additionally, Greek-American actor Ms. Melina Kanakaredes will receive the "ACG Heritage Award 2011". The Master of Ceremonies will be Ms. Sophia Papaioannou, Deree '93, Journalist & Co-Anchor, Skai TV. The "2011 ACG Alumnae Awards Benefit Dinner" will be held at 20:30 on Saturday, 2 April 2011, at Megaron, The Athens Concert Hall. This event marks the culmination of the College's 135th Anniversary of our founding in 1875, Smyrna. 2011 is the ACG "Year of the Woman", in tribute to the courageous women missionaries who founded our School.